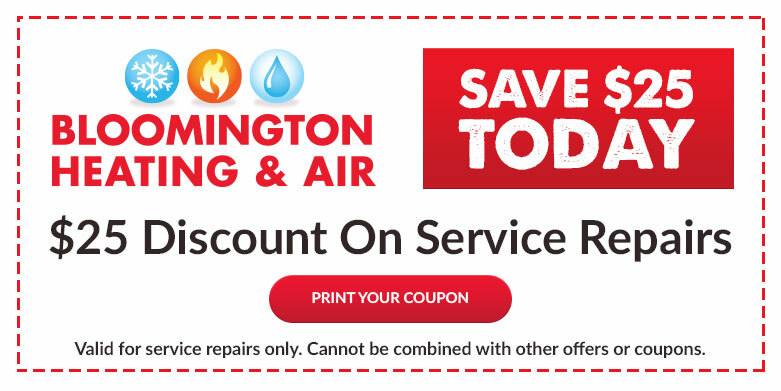 Bloomington Heating & Air offers a Comfort Savings Plan Agreement for residential heating and cooling systems in Bloomington, MN, and the surrounding areas. With our planned maintenance package, you can rest easy knowing your A/C or furnace is in good hands. Regularly scheduled maintenance reduces the risk of heating and A/C breakdowns and small issues that could affect other system components — decreasing the functional lifespan of your HVAC system. While professional system maintenance is important for every household, semi-annual heating and cooling system check-ups are especially crucial for heating systems in Minnesota, where fluctuating seasonal changes require the use of properly functioning HVAC systems year-round. Keep your residential heating and cooling system in top condition by enrolling in our Comfort Savings Plan Agreement. Writing Smaller Checks to Your Utility Provider! The A/C part of your HVAC system is responsible for keeping your home comfortable and cool when the seasonal summer heat arrives. But without professional HVAC maintenance services, your cooling system is at risk for decreased longevity, diminished efficiency, and delayed — or failed — system function during the warmest days and nights of the year. Avoid being left without cool air when you need it most by scheduling an HVAC check-up in spring, before the onset high-use season — summer — begins. You'll have peace of mind knowing your A/C will function optimally. What's more, scheduled maintenance improves system efficiency, so you save money on utility bills. HVAC systems work hard to ensure that your home stays comfortable throughout the cold season. The best way to ensure the longevity and proper function of your residential heating system is through planned HVAC maintenance services. To prepare your furnace and heating system for heavy-use — winter — the optimal time for residential HVAC maintenance is during the fall, right before your system will be depended upon for toasty indoor comfort both day and night. Before the frost fills the air outdoors, contact Bloomington Heating & Air to schedule professional fall HVAC maintenance. At Bloomington Heating & Air, we strive to provide the highest quality services for our customers to ensure their satisfaction and the proper functioning of their HVAC systems. During maintenance check-ups, various aspects of your system’s air conditioner and furnace will be inspected, among other essential components of the system. The goal of these inspections is to ensure that both heating and cooling in your unit are working optimally so that your system can run with as little risk of a breakdown as possible. If any issues are found, our technicians will let you know of the possible solutions and can perform any HVAC repair necessary. Maintenance is essential for ensuring heating and cooling systems work properly all year long, but not all maintenance services are the same. Our residential customers receive the highest quality HVAC services at low prices. We offer every service required to keep your system functioning at peak efficiency.